In astronomy, the Pleiades ( or ), or Seven Sisters (Messier 45 or M45), is an open star cluster containing middle-aged hot B-type stars located in the constellation of Taurus. 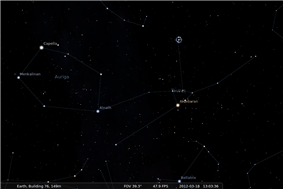 It is among the nearest star clusters to Earth and is the cluster most obvious to the naked eye in the night sky. The celestial entity has several meanings in different cultures and traditions. The Pleiades are a prominent sight in winter in the Northern Hemisphere, and have been known since antiquity to cultures all around the world, including the Celts, Māori, Aboriginal Australians, the Persians, the Arabs (known as Thurayya), the Chinese, the Japanese, the Maya, the Aztec, and the Sioux and Cherokee. In Hinduism, the Pleiades are known as Krittika and are associated with the war-god Kartikeya (Murugan, Skanda), who derives his name from them. The god is raised by the six Krittika sisters, also known as the Matrikas. He is said to have developed a face for each of them. The Babylonian star catalogues name the Pleiades MUL.MUL or "star of stars", and they head the list of stars along the ecliptic, reflecting the fact that they were close to the point of vernal equinox around the 23rd century BC. 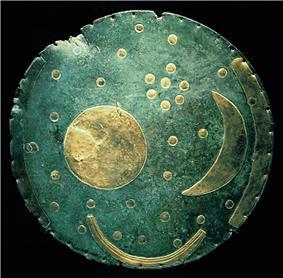 The earliest known depiction of the Pleiades is likely a bronze age artifact known as the Nebra sky disk, dated to approximately 1600 BC. Some Greek astronomers considered them to be a distinct constellation, and they are mentioned by Hesiod, and in Homer's Iliad and Odyssey. They are also mentioned three times in the Bible (Job 9:9 and 38:31, as well as Amos 5:8). Some scholars of Islam suggested that the Pleiades (ath-thurayya) are the star mentioned in the sura (chapter) Najm of the Quran. In Japan, the constellation is mentioned under the name Mutsuraboshi ("six stars") in the 8th century Kojiki and Manyosyu documents. The constellation is also known in Japan as Subaru (“unite”) and is depicted in the logo and name of the Subaru automobile company. The Persian equivalent is Nahid (pronounced "Naheed"). The rising of the Pleiades is mentioned in the Ancient Greek text Geoponica. The Greeks oriented the Hecatompedon temple of 550 BC and the Parthenon of 438 BC to their rising. The rising of the Pleiades before dawn (usually at the beginning of June) has long been regarded as the start of the new year in Māori culture, with the star group being known as Matariki. The rising of Matariki is celebrated as a midwinter festival in New Zealand. In Hawaiian culture the cluster is known as the Makali'i and their rising shortly after sunset marks the beginning of Makahiki, a 4 month time of peace in honor of the god Lono. 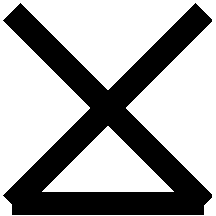 Animation of proper motion in 400,000 years (cross-eyed viewing ). Due to technical limitations on thumbnails, you must click through to the actual image to see the animation. Measurements of the distance have elicited much controversy. Results prior to the launch of the Hipparcos satellite generally found that the Pleiades were about 135 parsecs away from Earth. Data from Hipparcos yielded a surprising result, namely a distance of only 118 parsecs by measuring the parallax of stars in the cluster—a technique that should yield the most direct and accurate results. Later work consistently argued that the Hipparcos distance measurement for the Pleiades was erroneous. In particular, distances derived to the cluster via the Hubble Space Telescope and infrared color-magnitude diagram fitting favor a distance between 135–140 pc; a dynamical distance from optical interferometric observations of the Pleiad double Atlas favors a distance of 133-137 pc. However, the author of the 2007–2009 catalog of revised Hipparcos parallaxes reasserted that the distance to the Pleiades is ~120 pc, and challenged the dissenting evidence. Recently, Francis and Anderson proposed that a systematic effect on Hipparcos parallax errors for stars in clusters biases calculation using the weighted mean, and gave a Hipparcos parallax distance of 126 pc, and photometric distance 132 pc based on stars in the AB Doradus, Tucana-Horologium moving group and Beta Pictoris moving groups, which are similar in age and composition to the Pleiades. Those authors note that the difference between these results can be attributed to random error. The latest result (August, 2014) used very long baseline radio interferometry (VLBI) to determine a distance of 136.2 ± 1.2 pc, conclusively showing "that the Hipparcos measured distance to the Pleiades cluster is in error." This demonstration of an unrecognized error in the Hipparcos data has implications for the similarly designed Gaia mission. ^ a b c d e "SIMBAD Astronomical Database". Results for M45. Retrieved 2007-04-20. ^ a b Van Leeuwen, F. (2009). "Parallaxes and proper motions for 20 open clusters as based on the new Hipparcos catalogue". ^ a b c d Majaess, Daniel J.; Turner, David G.; Lane, David J.; Krajci, Tom (2011). "Deep Infrared ZAMS Fits to Benchmark Open Clusters Hosting delta Scuti Stars". arXiv:1102.1705 [astro-ph.GA]. ^ a b Percival, S. M.; Salaris, M.; Groenewegen, M. A. T.; Salaris; Groenewegen (2005). 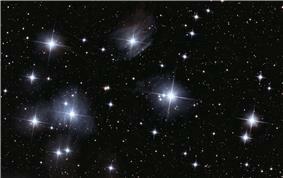 "The distance to the Pleiades. Main sequence fitting in the near infrared". ^ a b Zwahlen, N.; North, P.; Debernardi, Y.; Eyer, L.; Galland, F.; Groenewegen, M. A. T.; Hummel, C. A.; North; Debernardi; Eyer; Galland; Groenewegen; Hummel (2004). "A purely geometric distance to the binary star Atlas, a member of the Pleiades". ^ Kroupa, Pavel; Aarseth, Sverre; Hurley, Jarrod (2001). 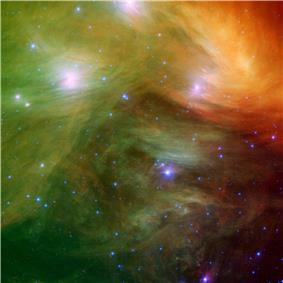 "The formation of a bound star cluster: From the Orion nebula cluster to the Pleiades". ^ Gendler, Robert (2006). A Year in the Life of the Universe: A Seasonal Guide to Viewing the Cosmos. Voyageur Press. p. 54. ^ Kyselka, Will (1993). "On the Rising of the Pleiades". Hawaiian Journal of History (Honolulu, Hawaiian Historical Society) 27: 173–183. ^ Meredith, P., "Matariki – Māori New Year", Te Ara Encyclopedia of New Zealand, updated 22 September 2012. Retrieved 1 January 2014. ^ Michell J. (1767). "An Inquiry into the probable Parallax, and Magnitude, of the Fixed Stars, from the Quantity of Light which they afford us, and the particular Circumstances of their Situation". ^ Frommert, Hartmut (1998). "Messier Questions & Answers". Retrieved 2005-03-01. ^ A New review: with literary curiosities and literary intelligence, page 326, Paul Henry Maty, Printed for the author, 1783. ^ Mémoires de l'Acadêmie des sciences de l'Institut de France, page 289, Didot frères, fils et cie, 1786. ^ Edme-Sébastien Jeaurat, Carte des 64 Principales Etoiles des Playades par M. Jeaurat, pour le 1.er Janvier 1786. ^ a b Soderblom D. R., Nelan E., Benedict G. F., McArthur B., Ramirez I., Spiesman W., Jones B. F.; Nelan; Benedict; McArthur; Ramirez; Spiesman; Jones (2005). "Confirmation of Errors in Hipparcos Parallaxes from Hubble Space Telescope Fine Guidance Sensor Astrometry of the Pleiades". ^ Turner, D. G. (1979). "A reddening-free main sequence for the Pleiades cluster". ^ a b Pan, X. (2004). "A distance of 133-137 parsecs to the Pleiades star cluster". ^ Francis C., Anderson E.,; Anderson (2012). "XHIP II: clusters and associations". ^ Melis, Carl; Reid, Mark J.; Mioduszewski, Amy J.; Stauffer, John R.; Bower, Geoffrey (29 August 2014). "A VLBI resolution of the Pleiades distance controversy". Science 345 (6200): 1029–1032. ^ a b Adams, Joseph D.; Stauffer, John R.; Monet, David G.; Skrutskie, Michael F.; Beichman, Charles A.; Stauffer; Monet; Skrutskie; Beichman (2001). "The Mass and Structure of the Pleiades Star Cluster from 2MASS". ^ Moraux, E.; Bouvier, J.; Stauffer, J. R.; Cuillandre, J.-C.; Bouvier; Stauffer; Cuillandre (2003). "Brown in the Pleiades cluster: Clues to the substellar mass function". ^ Basri G., Marcy G. W., Graham J. R.; Marcy; Graham (1996). "Lithium in Brown Dwarf Candidates: The Mass and Age of the Faintest Pleiades Stars". ^ Ushomirsky, G., Matzner, C., Brown, E., Bildsten, L., Hilliard, V., Schroeder, P.; Matzner; Brown; Bildsten; Hilliard; Schroeder (1998). "Light-Element Depletion in Contracting Brown Dwarfs and Pre-Main-Sequence Stars". ^ Converse, Joseph M. and Stahler, Steven W. (2010). 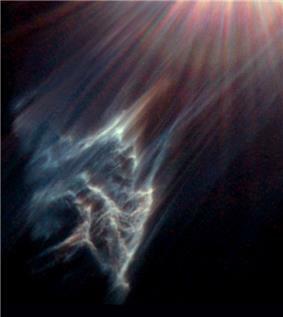 "The dynamical evolution of the Pleiades". ^ Gibson, Steven J.; Nordsieck, Kenneth H.; Nordsieck (2003). "The Pleiades Reflection Nebula. II. Simple Model Constraints on Dust Properties and Scattering Geometry". ^ ScienceDaily (2007). 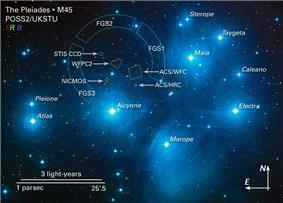 "Planets Forming In Pleiades Star Cluster, Astronomers Report". Retrieved 2012-11-15. Hurst, John; Lawrence, Pete; Crowther, Paul. 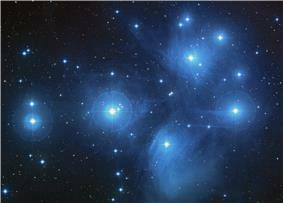 "M45 – The Pleiades". Deep SkyVideos.